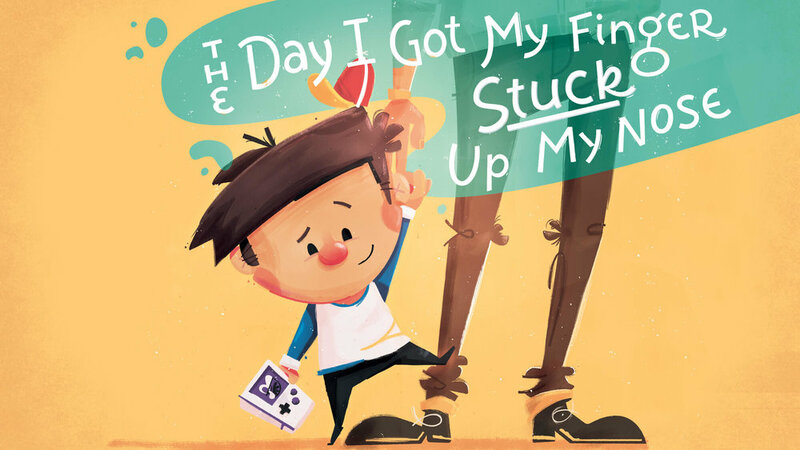 Children's book illustration and cover about a boy who gets his finger stuck in his nose. 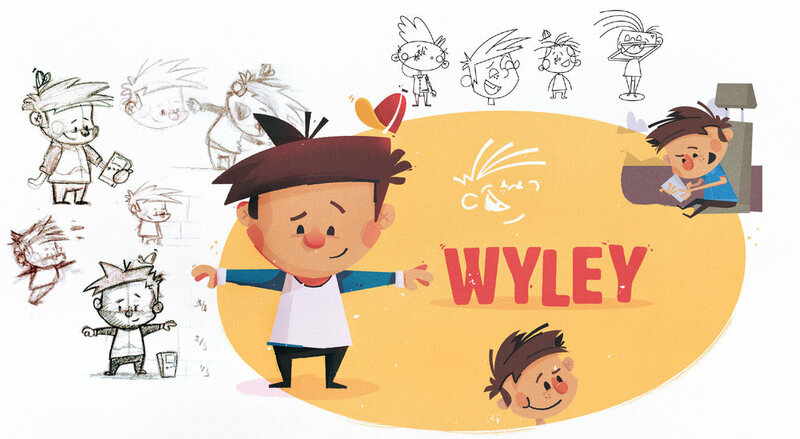 I've had the pleasure to spend a few months slowly developing Wyley, the character for my first children's book that was written by Brian Walsh and of course illustrated by me. While the book is still in development, the promotional graphics and cover are finished here. 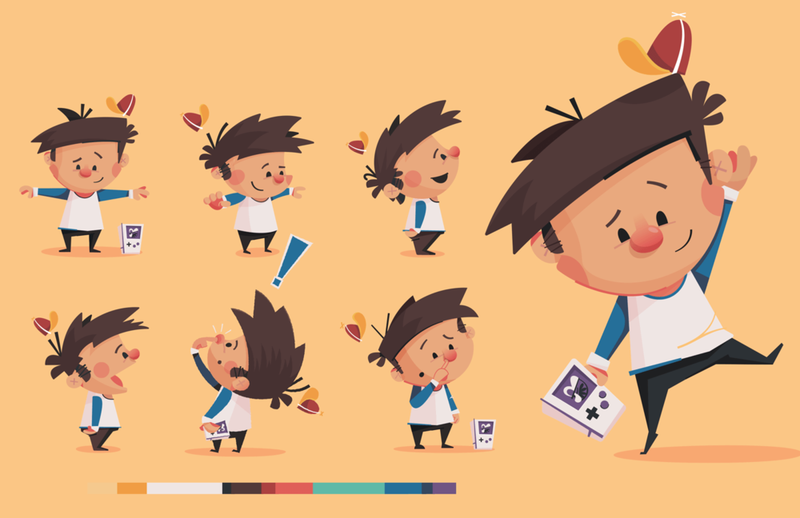 Here's a bit of the process that went into developing the main character. With such an involved challenge, it's best to break projects down into sections for myself. Organization helps me actually start a project, otherwise I freeze up with intimidation. I call the first section the interview, basically who is Wyley? What does he do? Given x number of situations, how would he react in each of them? Does he get in trouble? If so, how does he handle it? How are his grades? How old is he? etc. Of course we have the story itself to draw on, but we need to do some deep digging and of course use our imagination to really learn his spirit of things. This is what makes a character interesting. He needs to feel real. Brian and I had a lot of conversation around this and went back and forth a lot. Now it's time to put paper to pencil. Getting things from my head and in front of us to look at. We know some vitals of the character, Wyley is about 5-7 and a very kind boy that can get in trouble, but would be very sad if he did. 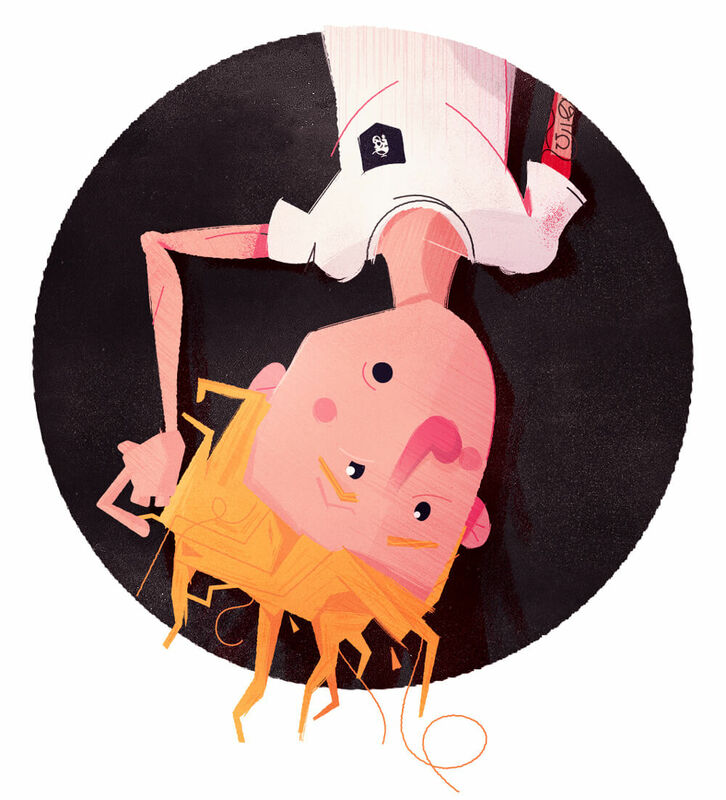 He's certainly not Dennis the Menace, but he's not exactly a golden angel boy either. He's like many of us when we were younger, honest but will get away with things if possible. He likes to play games, he's got parents that both love him very much. He's always ready for a good moral (of course) but it may take him a little disaster to find it. Inspiration on this character came a lot from of course fellow modern illustrators and cartoons, but I think most strongly he has a lot of Calvin from "Calvin and Hobbes" in him, as well as a lot of old references to Disney's "Little Golden Book"s. Stylistically I wanted to keep things close to my comfort zone as it's such a personal project that should really show off my style, but keep things paying an homage to older children's' books with a lot of vignettes and warm colors, simple shapes etc. The biggest challenge here in the sketching phase was getting his proportions correct. I wanted him to be functional as a character in the event of things like animation or all the different poses and positions he'd have to be in throughout the book. Contrastly, he needed to be sort of short and stubby, big hands, tiny legs, big head etc. These proportions helped him become that young young boy we needed. I struggled for a while with this. For the longest time he kept coming out looking like a teen or pre-teen. Shortening proportions and blowing certain things up real large helped that, as well as facial elements positions. After I finally got the sketches of Wyley where I thought they were showing the skeleton of what I wanted, I got into Illustrator, where I was able to really tweak these things and get them where I wanted. It took some 10-15 designs in illustrator still to get him just right. Most importantly, each time I thought he was 'good enough' I did it again. I'd redraw over and over until he was really at a point of excitement. Just like we draw our favorite logos or characters when we are younger, I drew wyley each day for warm ups, in different positions to make sure he held up in some way in whatever situation. At a certain point, the intimidation broke down, I was finally ready to draw him for final. I understood who he was and how to draw him. I was confident he was ready. Once I did that, I did 4-5 positions and angles to understand how he works anatomically. While the book is not yet finished at time of posting this (I'm working on it! ), I am happy to say that the cover is done and naturally sketches of the inner pages are also complete. Treating the book as an identity, I'm warming up to a certain number of colors, trying to use certain colors as main points of contrast and focus. Keep drawing. Just draw and draw and draw until a character is where you're comfortable. This is probably the most obsessed I've gotten over a character but I also am the happiest with him. I'm excited to keep it up with the rest of the characters for this book. What will his father look like (actually i already did him) what about his mother? does he have brothers? Sisters? Hmm.